he conclusions from the Aquatic Species Program are not correct,” says Algenol CEO Paul Woods, taking issue with the 1980’s assessment that photobioreactors cannot be a cost effective means for biofuel creation. He has proof. 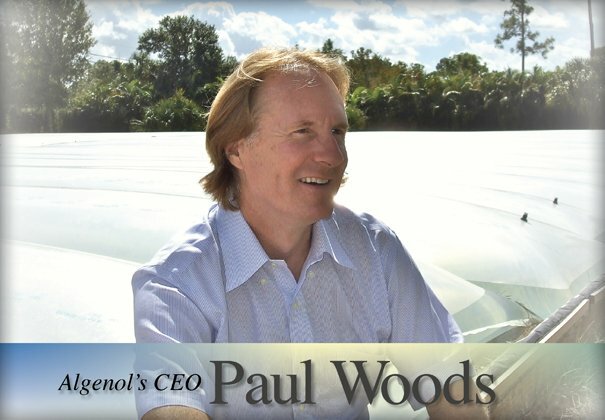 Algenol, basing their ethanol production on the patented Direct to Ethanol® technology that Woods invented back in 1984, is ultimately pursuing the commercial scale-up of tens of thousands of acres in Florida and Mexico, using inexpensive proprietary photobioreactors. Woods’ ethanol producing technology was first conceived while he was a genetics student at the University of Western Ontario. Over the next decade he collaborated with Dr. John Coleman and Dr. Ming-De Deng at the University of Toronto to demonstrate proof-of-principle in the laboratory, culminating in scientific publication of their results in Applied and Environmental Microbiology in 1999. During this period he was also building a very successful career in the natural gas business, founding two successful companies and taking one of them public, allowing him to retire comfortably at the age of 38. The relatively cheap price of oil made it uneconomical for Woods to pursue commercialization of his Direct to Ethanol® technology until 2005 when oil prices began to soar. In 2006, when oil reached $50 a barrel and appeared to be headed higher, he teamed up with biotechnology entrepreneurs, Ed Legere and Dr. Craig R. Smith, to found Algenol. Algenol’s funding and developmental support since then has come from the founders, as well as two grants and some high level partnerships. 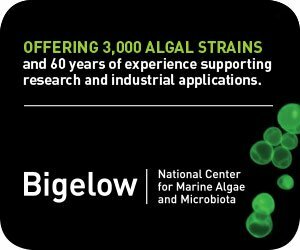 The U.S. Department of Energy (DOE) selected Algenol, one of three algae companies, for a $25 million grant to build a pilot-scale biorefinery to make ethanol directly from carbon dioxide using hybrid algae. Funding came from the American Recovery and Reinvestment Act. The integrated pilot-scale biorefinery will be located in Lee County, Florida, will consume almost two dry tons per day of carbon dioxide obtained from industrial sources, and will produce 100,000 gallons of fuel-grade ethanol per year. 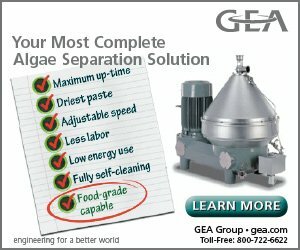 The Dow Chemical Company (Dow), the National Renewable Energy Laboratory (NREL), the Georgia Institute of Technology (Georgia Tech) and Membrane Technology & Research, Inc. (MTR) will collaborate with Algenol to complete the project. 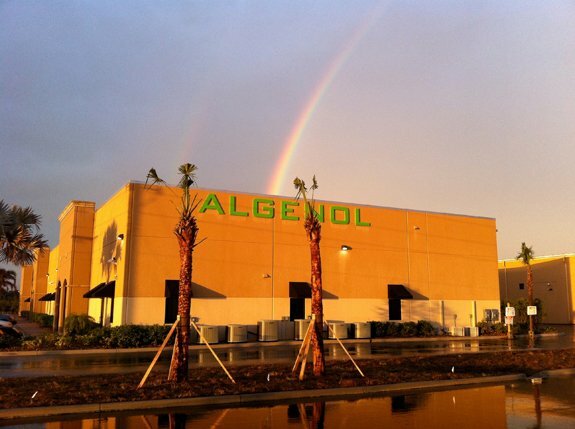 More recently Algenol received a $10 million grant from Lee County, Florida, to build a 40,000 square foot Integrated Bio-Refinery facility for the sustainable production of biofuels and green chemicals, all the way from the laboratory to commercial scale. 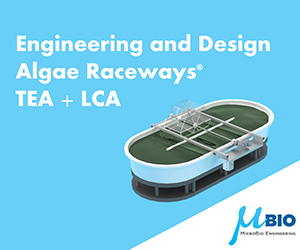 The Lee Integrated Bio-Refinery facility will bring together in one place biology, engineering, carbon dioxide capture, green chemistry development and outdoor development and production facilities. 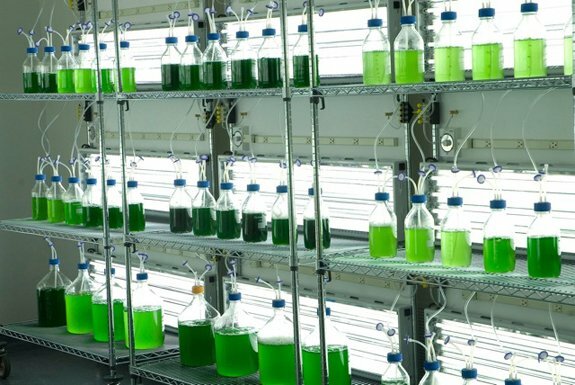 We spoke with Paul Woods recently to find out more about the rapid progress Algenol is making in turning his twenty-five year old technology into the realization of mass production of inexpensive ethanol from algae. Where is Algenol in its development path right now? In late October we opened the new facility on a 40 acre lot in Lee County, Florida—two 20,000 square foot buildings housing four disciplines: advanced engineering, biology, and gas management laboratories, and our green chemistry program. Then we built a roughly 8,000 square foot building adjacent to that. We just got our occupancy permit for that building last week. What we are working on is, first off, building out the Department of Energy’s integrated biorefinery. But the Lee County facility even goes a few steps beyond that. It includes our green chemistry program. It includes a commercial module, and it also includes all the way to fuel-grade ethanol, which is not part of the DOE Grant. So, building out the commercial module in 2011 and having that begin to operate by the end of 2011, that’s where we are and I have absolutely no doubt we’ll hit that target. How much ethanol can you create in this facility? This site should make around 100,000 gallons in the first year of operations—2012. Because our whole process is in these five by fifty foot modular photobioreactors, the scale up is much different and much easier. We really only deal with 1200 gallon cultures. This site has around 3000 of those photobioreactors, and that is large enough to represent a commercial module. So if you were to make a system bigger, you’d just do more and more of these modules. Describe your direct to ethanol bioreactor process, and how does the algae secrete ethanol? The first thing is that we use hybrid algae. In our case, algae can naturally make ethanol, but we significantly enhance that capability, which basically links photosynthesis and internal production of sugars with the conversion of those sugars immediately into ethanol. So, the algae gets carbon dioxide, sunlight and seawater and makes the small molecule ethanol. It leaves the cell naturally, goes into the culture and evaporates out of that culture. We have closed photobioreactors that lay on the ground—they look like a huge long ziplock bag. The ethanol-water vapor collects in the headspace above the culture at night when it gets colder, condenses and runs down the inside walls into collection troughs. That ethanol-water mixture is enhanced in its concentration of ethanol compared to the culture, and we take that and purify it. The first and second steps of separation are all powered by the sun, so we don’t pay for any of those separations, nor creation of the molecule. In our case, more than 90% of the carbon that goes in, in the form of carbon dioxide, gets converted into ethanol. It really allows us to produce a molecule much cheaper (than other methods). We’re trying to, on a commercial basis, produce ethanol for around 85 cents a gallon. And I don’t think cellulose or any other process can beat the dollar mark, or even come close to it. When you use the term “hybrid algae” what exactly do you mean? If you’re going to make an octane molecule directly, you’re not going to find that naturally in an algae. But an ethanol pathway to create ethanol does exist in many algae. So I would make the distinction that if I’m going to put in a whole gene cassette that has to produce a target molecule like octane, that is a genetically modified organism. That’s great. We’re going to do that for our green chemistry program—you don’t have propanol coming out of an algae, not naturally anyway. But that is distinctly different from ethanol, because ethanol can be made natively by algae and hence we use the term enhanced or hybrid for that because we use a number of techniques to push these organisms to make more of a native and natural molecule. After the condensation, the runoff and collection, is there a distillation process after that? There are two or three steps, because algae makes quite a dilute stream and then it’s upgraded into the condensate. That condensate comes off and we put it through a roughly ten times upgrade. And then we have a choice. We either send it off to distillation and a molecular sieve—the way corn ethanol plants strip out that last bit of water—or, akin to our partnership with Membrane Technology Research (MTR) in Menlo Park, California, a two-membrane system where we can go straight to fuel grade ethanol. The MTR solution may be both cheaper to operate and lower capital cost than the distillation mol sieve. So we certainly will be building and testing the MTR path. You have a “no harvest” strategy. Please explain. The molecule leaves the cell naturally, enters the culture and then evaporates out of the culture. So what really changes the economics of our whole process is that that molecule is not trapped in the cell, so we don’t harvest 10 or 15 or 25 percent of the cells everyday, hence we have a “no harvest” strategy. We don’t kill the cells, crush them, or dewater them. So we don’t have to spend a lot of energy in nutrients building new cells. Our partner Linde, when they went to their Board of Directors, used the example that this is essentially akin to milking a cow, as opposed to butchering it. We don’t kill the algae to extract a product that’s trapped inside of it as you might with biodiesel or the large chemical oils. The ethanol molecule is much smaller and it just leaks out of the cell. Who are some of the strategic alliances Algenol has and what are they bringing to the party? Our first partnership was with Biofields in Mexico, which is owned by Alejandro Gonzalez and other members of the Corona beer family. Building out direct ethanol capability in Mexico from algae was our first partnership. The second was with Dow Chemical and we have a number of programs with them, including supplying the plastics that we use in our photobioreactors. Inside the DOE grant we have smaller partnerships with Georgia Tech, Membrane Technology Resources and NREL as a part of the grant. Past the DOE grant, our new academic partner is Florida Gulf Coast University (FGCU). Another business partner that came after the DOE grant is Linde Gas, the largest gases company in the world, headquartered in Munich. And they play a very key role in partnership with us on engineering, upstream delivery of CO2, and downstream purification of ethanol. Valero became our next partner, and Abengoa became our first large European partner, and both of those will mainly deal with site integration, CO2 uptake and conversion into a target molecule, most notably ethanol, but it will extend into the green chemistry world. Do you see Algenol getting into biodiesel at some point, or are you totally focused on ethanol? We really did start off this company to be just ethanol, but now we’ve gone into the three or four green chemicals that are all algae derived but essentially get down to the three and four carbon molecule building blocks. We are definitely not going into biodiesel as a primary product. I have never seen a process inside the algae cell where you’re making an oil that is homogonous enough—oil and ethanol are very different because the oil is never homogenously produced. The other thing is I’ve never seen a system that can get oil out of that cell economically. We might be the oldest algae company, we might be one of the biggest algae companies, but I have still not seen a single thing cross my desk that would convince me to go into the biodiesel business. If we’re going to make an oil, it would probably be a lot higher value than a biodiesel. And if we were going to go after a molecule trapped inside the cell, with spent biomass, I think I’d rather go after something that’s good for humans. We don’t have an internal program to do this, but if we could have our algae make something like Omega 3, then I would consider something like that. Your company has researched thousands of algal strains. What are some of the conclusions you can make at this point? The first conclusion is that the majority of algae are the same, like all bell-curved populations. At this point we’ve examined maybe 10,000 or so, I think there are about 2500 that we think are even reasonably special and distinct. And of that, there are probably 100 to 150 that we think have very unique capabilities. Of that we’ve probably done 10 or 15 full genome analyses. So we’re down to fingers and toes of truly special algae. Can you say what strains you are using in your scale-up? Actually I don’t even think it’s relevant. I think it’s more relevant what makes them special, like in our case we use saltwater. So it can’t be a surprise to anybody that high salt tolerance is something that we value. High heat tolerance is something we value. There are a number of places where having a specific adaptation is valuable. Final strains aren’t important. Final strain capabilities are important. Algenol has been in business for about five years which, in algae biofuel terms, makes it one of the more mature companies in the field. Well, I would actually take a tiny exception to that in that Algenol is really based on work of three people starting in 1984, when I came up with this idea, then in 1989 when I teamed up with John Coleman, and then a couple years later when Ming-De Deng came in and participated on the original patents. All three of us came back and work together now. So I would actually say that our history far surpasses other companies because much of what we do goes back to the eighties and nineties. What are some of the most important developments you have witnessed in this industry over that time? The first thing is the question of whether you can actually make industrial quantities of a direct molecule, and the answer to that is yes. That is the very first and most important thing. Secondly, the conclusion of the Aquatic Species Program about photobioreactors is not right. These guys came to the conclusion that you can’t grow algae with these things in a way that makes sense. One of the last people who participated in that program, Ed Laws, now works with us, and he’s a fantastically smart person. That was the eighties, but there’s been a significant amount of advancement in both algae and technology. I think we’ve not only demonstrated in principle that you can build a photobioreactor and make it work, we have them sitting outside, and they are inexpensive, and they are durable. There were a lot of people a few years ago going around saying it’s impossible. It’s not impossible. We have them and they are economical. I think time has really been good to algae biofuels. And I’d say the people who always are criticizing algae, saying that this is always ten years away, twenty years away, are incorrect. Just come out and see it being built in Lee County, Florida. Where do you see Algenol’s and the industry’s growth over the next five years? I think something that will help change the algae landscape is the landholders, the big families in Florida and Texas and Mexico. They would really love to have alternate crops on their land, besides orange groves and natural gas wells. And Algenol is a really good alternative to that, because you take one of our photobioreactors and lay it on the ground and you do nothing to hurt that land. That really is important for the big legacy landholders. So I think you’ll see a very rapid increase in the companies and land availability with which we can scale it and build it. Any message for the industry? We’re a fairly new member of the ABO and we’re a very happy member of BIO, and I’m very hopeful that the industry can come together and really have a voice in Washington, because I think that we have a fairly steep uphill battle with regard to legislation and parity with cellulose. I think that algae is not understood well at all, so to have your magazine really start to educate people, to have BIO and ABO start to educate people, I think it’s very valuable for the industry.